Earlier this year, Netflix Australia was launched in an effort to reach a larger worldwide audience with its services that continue to replace a­ny need for cable TV for most people. And while the original launch only included 1,500 shows, it’s anticipated that it will continue to release new content as time progresses to bring it up to snuff. But just because there are relatively few shows at the moment doesn’t mean that there aren’t great female-centered already available for you to stream right now. Since its transition away from simply streaming content, Netflix’s original shows have given life to all kinds of varied and diverse stories that internet audiences have been craving. One such show is The Unbreakable Kimmy Schmidt, created by the always-fabulous Tina Fey. This sitcom follows the youngish, naïve Kimmy Schmidt as she adjusts to her new life in New York City after living in an underground bunker with a doomsday cult for the past 15 years. It features a predominantly female cast, and doesn’t shy away from depicting strong, independent female characters, just as its jokes never shy away from attacking microaggressions, or overt racism, classism, and feminism. This dramatic conspiracy thriller is about professional con-artist Sarah Manning whose entire life changes after she witnesses the suicide of a woman – a women who looks exactly like her. Sarah discovers that she is a clone, with a dozen or so other doppelgangers running around. This female-centric show features a cast made majorly of women (mostly the same woman, in fact), and the series, especially Tatiana Maslany’s performance as Sarah and her clones, has been critically acclaimed since its premier in March of 2013. It’s popularity continues to rise, and with season three scheduled to debut sometime this year, now is a great time to binge-watch the first two seasons to catch up. On the surface, the show plays like your typical crime drama, featuring brutal murders and lots of mysteries to solve. Look a little closer, and you’ll see that this series gets the treatment that audiences have been demanding: real characters with complex and diverse personalities. Mireille Enos is fantastic as career-oriented detective Sarah Linden who neither wants nor needs a man in her, and the series garnered critical acclaim for its portrayal of homosexual relationships (with three openly gay female characters). Even the street-wise detective who also happens to be devoted to his girlfriend and passionate about vegetarianism in the male lead spot is a breath of fresh air. The show has been a worldwide success since its premiere back in 2013, and it’s because it’s more than just a comedy about women in prison. It tackles social issues that many other shows are still too afraid to even mention. It features a diverse cast of different people from all across the LGBT rainbow, and tells their stories without dehumanising them. The plot lines acknowledges that women can be just as cruel as their male counterparts, just as male characters are not treated as ridiculous caricatures. The dialogue is funny and realistic, natural and never forced. Not only that, but the characters on the show aren’t perfect supermodel types: they’re prisoners wearing jumpsuits and don’t have access to cosmetics or hair products, and that’s how they look. This show has become so popular because it feels like real life. And again, with a third season on the horizon, there’s never been a better time to get up to date with OITNB. So when you’re looking for something to binge-watch in the future, remember that there are plenty of great, female-centric TV shows streaming on Netflix right now. Netflix Australia could also usher “cord cutting” into the continent in much the same way that streaming services have in the United States. What’s more: Netflix Australia could also give Australian movie theaters a run for their money, in the way that companies like Amazon, DirectTV, and Netflix have in the states. 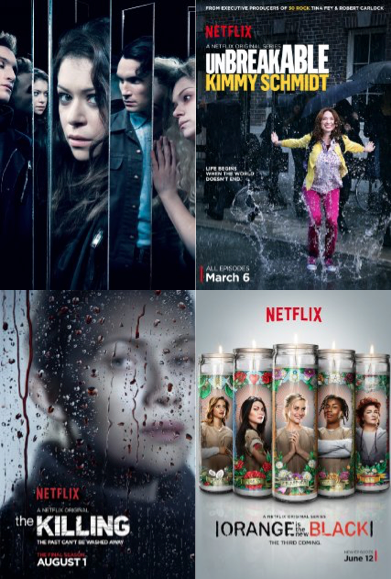 Whether you’re looking for a hard-hitting, pro-feminist crime drama that doesn’t fetishise police work, an action-packed thriller that doesn’t leave women in the passenger’s seat, or some comedies that aren’t afraid to face social issues head-on, you’re sure to find the perfect feminist show to watch.